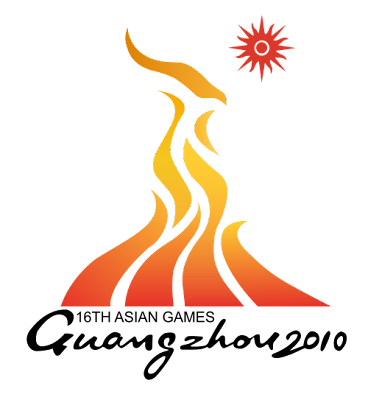 The 2010 Asian Games, also known as the XVI Asiad, is a multi-sport event in Guangzhou, China that began on 12 November and finishes on 27 November 2010. Guangzhou is the second Chinese city to host the Games, after Beijing in 1990. A total of 476 events in 42 sports will be contested by athletes, making it the largest event in the history of the Games.The games will also be co-hosted by Dongguan, Foshan and Shanwei, the three neighbouring cities.It will also be the last iteration of the Games to have featured such big events, as the Olympic Council of Asia (OCA) have enforced new hosting rules for future games, beginning with the 2014 Games. 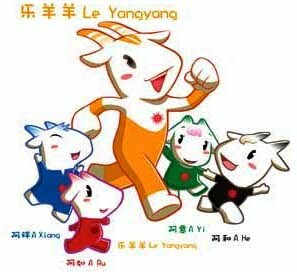 Five sporty rams, dubbed "Le Yangyang," will serve as the mascots of the Games.It is a stylized goat, which, in Chinese tradition, is a blessing and brings people luck. It is also a representative symbol of the host city Guangzhou, which is called the "City of Rams" or "City of the Five Rams". The five rams are named A Xiang (祥), A He (和), A Ru (如), A Yi (意) and Le Yangyang (樂洋洋), and are a play on Guangzhou's nickname, "City of Goats". Moreover, the Chinese character "yang," or "goat," is also an auspicious symbol because, when read together, the Chinese names of the five rams are a message of blessing, literally meaning "harmony, blessings, success and happiness" (祥和如意樂洋洋). For the first time in history, the opening ceremony was not held inside the stadium; instead, it was held along the Pearl River on Haixinsha Island. Athletes were paraded by boats along the Pearl River.The island holding the ceremony covers 174,000 km. At least 40,000 fireworks shots were used in the event. 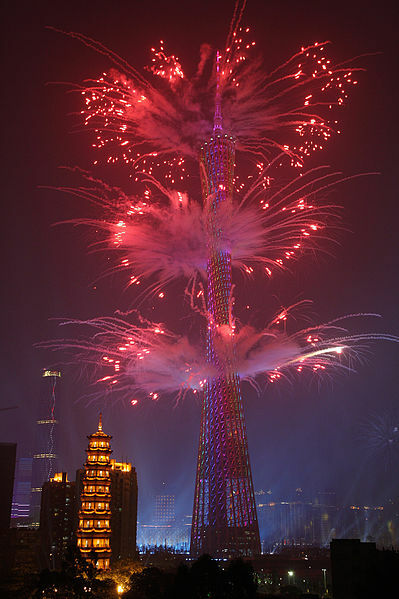 About 30,000 seated spectators were at the event.Fireworks were then shot out from the Canton Tower. The ceremony featured the water-themed arts show and culture of Guangzhou.The event was choreographed by Chen Weiya (陈维亚) lasting four hours with thousands of performers.